Joint boss Glenn Kirkwood says his Matlock team was “excellent” despite losing 4-0 at home to a strong Mansfield Town side on Tuesday night. The additional fixture was hastily arranged last Friday at Mansfield’s request, with the Stags sending first team squads to both the DCJ Group Arena and to Gainsborough Trinity. Matlock finished the game with ten men after the 58th minute sending off for midfielder Callum Lloyd with the score at just 1-0 and the Stags last two goals came in the final three minutes. “It’s not very often the bookies get it wrong, Mansfield are favourites to win League Two,” said Kirkwood. “I thought we were unfortunate to be a goal down at half time, we played really well and held our own against a top, top side. Last Saturday the Gladiators again did well in a 2-2 home draw with Burton Albion when Craig Hopkins was in sole charge. Albion took an early lead only for Town to strike back with two trialists finding the net in a four minute spell before Marcus Dinanga notched a deserved goal on his return to Matlock. “We played really well against a strong team containing several players who have played in the |Championship so there ‘s a lot of positives we can take from the game and our performance” said Hopkins. Matlock added to their squad after Tuesday’s game with their fifth signing of the summer as full back Ryan Wilson signed on the dotted line. 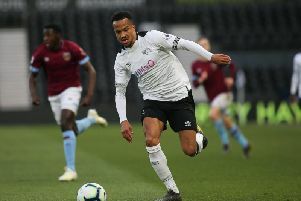 Wilson, the son of former Derby and Chelsea striker and former Ilkeston manager Kevin Wilson was with Alfreton Town last term after joining them from Conference National side Gateshead. Wilson also played for his father at Ilkeston. The remainder of Matlock’s pre season campaign sees them playing non league sides. A youthful line up was expected to have played at Staveley last night (Wednesday) before Matlock head to Worksop Town on Saturday and Heanor Town on Tuesday. Their final warm up game is at home to Belper Town next Friday. Cleveland Taylor, Michael Williams and Rory Coleman are all on holiday and will return against Heanor. On the injury front, Adam Yates will need a check after coming off with a leg injury against Mansfield. Marc Newsham (tight hamstring) and Luis Rose (thigh) should have recovered in time to face Worksop.